Recently I have been training for the lead season again. I find it fun to transition my boulder strength into endurance, which means getting totally pumped in the forearms. The summer weather has motivated me to climb more. I have been climbing a few weeks in a row now to gain endurance. Yesterday was the perfect moment to test myself during the kickoff for the national lead competition. The two qualification routes went quite well, I collected enough points to advance to the finals. The first qualification felt relatively easy to me. I think most of the competitors topped this route. 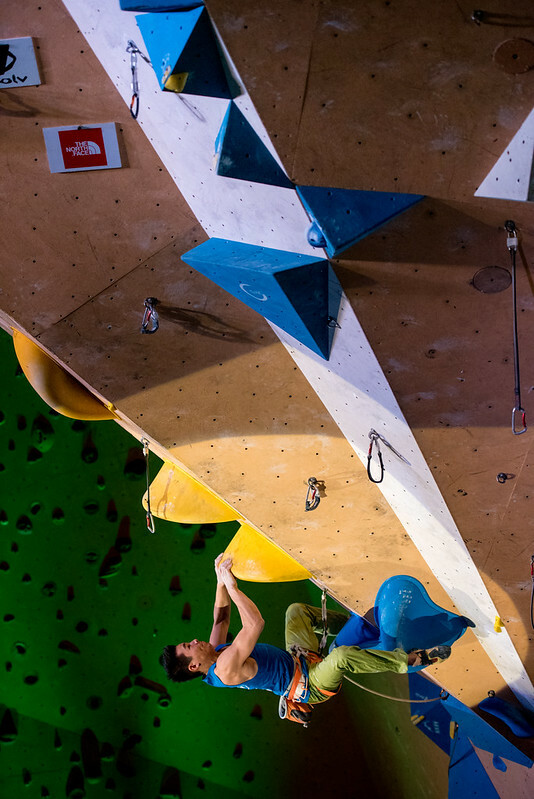 The second qualification route felt more bouldery than the first route and was set on a vertical wall. The final route began with a run start. Nowadays you are seeing a lot of these running problems set on boulders. It was the first time I saw this set in a route. The setter took a small risk there, but fortunately it went well because everyone managed to pass this first part. Anyway, I didn’t want to do this move statically, so I ran and jumped towards the next two holds 🙂 Fortunately I managed to grab the huge jugs and could cruise most of the time in the finals route. Unfortunately I didn’t top out the route but I enjoyed the climb a lot. I just missed the podium by ending up 4th. Instead of 3 competition routes I climbed almost 10 routes that day and had a lot of fun. In my opinion, having fun is an important factor during a competition day. Check out the results here. All photos are copyrighted by NKBV. Would you like to compete too? Sign up here. I’m back for an announcement! This Saturday the sport national championship will take place in Amsterdam. It is the time of the year to witness the best 20 competition climbers in action and I’m one of the performers 😀 The tickets are sold out. But no worries, livestream is available for those who want to tune in. The reason why I was off the grid was due to a knee injury. Fortunately I recovered from that injury and I have been training like Patxi for the past few months. That means pushing limits while carrying extra weights. I love the transition from bouldering to lead climbing. Anyway, yesterday was my final training and I can’t wait to go a muerte on Saturday! As you know the lead season started a month ago. The first lead competition was held in Tilburg. I consider Neoliet Tilburg as one of my home gyms where I like to climb in the amazing roof. The qualification routes went pretty well. The first route was set in the roof. I had no trouble with the roof climbing and it felt like a warm up route to me. The second route was set on the main wall. It was more a long boulder with a challenging start. Fortunately I could boulder my way up and because of this I advanced as 2nd to the finals. I can cut my story short about the finals. My left foot slipped from the first hold. My attempt was over. I felt unhappy, however I know how to cope with disappointment. Unfortunately I ended up 8th. After the competition I went to Italy for 2 weeks. I just got back from a relaxing holiday to Arco when 3 days later the 2nd lead competition was held in Amsterdam. I had to change my focus from rock to plastic in a short period of time. 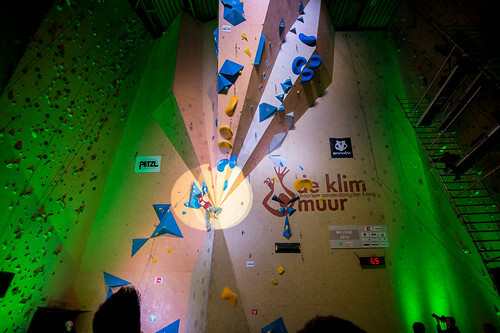 Before the competition I climbed routes in Tilburg and had another boulder session in Monk. With a rest day in between the climbing sessions I was hoping for a peak moment during the competition. 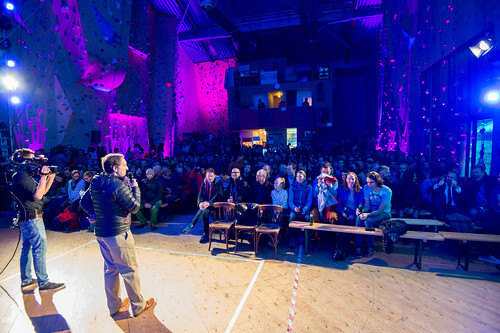 This competition was held in Mountain Network Amsterdam. The first route was easy, I topped this route without getting pumped in my forearms. The second route went really well until I fell on the last move. I advanced as 2nd to the finals. I had plenty of time to prepare for the finals. The route contained a lot of moves. My endurance level was being tested during my climb. I could climb and fight until I was totally pumped in my forearms. I ended up 2nd which currently places me 3rd in the overall ranking. I’m happy with the result and will try to keep my place or advance to the top! My my my, what a surprising national championship! Saturday morning I published a post about my comeback into the nationals and about my hope of advancing to the finals. I was super excited from the moment I entered the venue. 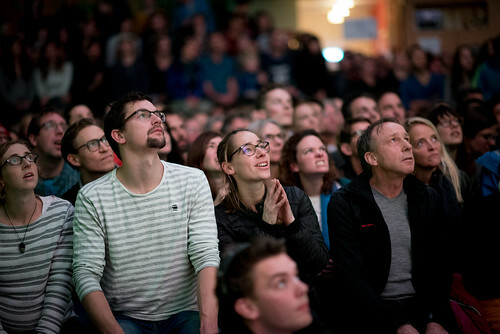 The organisation chose an awesome location for the championship: Westergasfabriek Amsterdam. The sound and DJ setup was great. The Monk bar was present. The isolation was good enough to warm up for all of us. I had one hour to warm up. I touched some new rough holds on the training wall and did some leg stretching, pull-ups and push ups. Soon it was my turn to start in the first boulder. I had 5 minutes to solve this problem. The pinch felt good but the next hold was quite hard. I guess I wasn’t really warm yet. After a few attempts I tried a different sequence where I skipped the blue hold and went straight for the bonus. I managed to fix the bonus hold but from there on I was stuck in this problem. I was disappointed for not sending this problem, but afterwards it turned out this bonus hold was crucial for the score. The second problem was an interesting one with volumes. I was having a hard time to hang on to these volumes. Unfortunately I didn’t make it to the bonus hold. I was upset with this one. Two down and still no results. The next problem was set on the other side of the hall. I had no idea what the status was of the other competitors. Actually I didn’t care and I had to refocus myself during my 5-minute break. My mind-set changed from trying to sending! When I saw the third problem, I thought I should be able to climb this one. In my first attempt I was really close and touched the final hold! I knew I could send this boulder and took a short break focusing on the last 2 holds. In my second go I managed to match my hands on the final hold. Yes, I was back in the game! The last problem was interesting. These new holds were small and raw. The bonus hold was a tiny edge, just enough to stick it. I needed 3 attempts for this boulder. The first attempt, I made a mistake and misread the sequence. The second time I jumped but missed the final hold on my deadpoint. The last attempt I sent it. All together, the result of 2 tops in 5 tries and 3 bonus holds in 10 tries (2T5 3B10) was enough to make it into the finals! I was so happy that I achieved my goal!! I really enjoyed the semi finals despite the first 2 problems. Now I could relax, catch some breath and check out who the other finalists were. Timo, Tim, Remmelt, Ferdinand and Hans were going to be my rivals for the evening. This meant that I would have to compete against tall climbers. I hoped the setters had set problems where I could fit between the holds or really tricky problems where I could use technique. That evening I got back into the isolation area again and I was ready for the finals. I sent boatloads of messages to family and friends and shared that I had made it to the finals. Then I had to turn in my phone again and was isolated from the digital world. I actually felt pretty good and wasn’t tired from the semis. My hands and skin were okay despite the new raw holds. I had to warm up again and stretch some more. Soon we were introduced to the audience and for the first time we could see the final problems. Then it was time to climb the finals!! In my first problem, I felt it was too hard to cross over and tried a different sequence. Unfortunately that didn’t work out well. Bummer, no bonus or top. The second problem at first sight was in my opinion not a beauty at all. The yellow big volume was really slopey. I had to pinch this volume and tried it with my left and right hand. Somehow the friction on the yellow volume got worse after each try. Perhaps it was the light that warmed up the volume, I don’t know. The bonus hold was too far for me to reach after the yellow volume, so I tried to match first. Unfortunately I ended up with no bonus or top again. At this moment, I was getting frustrated. 2 problems down and still no results. In the isolation area I could hear the crowd cheering for the climbers. When everyone came back from the second problem, it was really sad to know that no one had a top so far. The third problem was a slab boulder set on a vertical wall. This one looked hard from the start. I could easily stand on the volume, just on friction, using my LaSportiva Futura shoes. However I couldn’t reach the first hold. At that moment I knew I had no chance in this problem. I was there just for fun and tried to skip the first hold and managed to grab the second hold. I knew it was impossible this way, but I had to try this sequence. Again, no results. I knew none of the competitors had a top so far and they were also really annoyed, frustrated and angry. It might sound strange but somehow I was relieved when each one of them came back into the isolation without a top. It all came down to the last problem, which was really hard. I could still win if I was able to flash this problem or send it in just a few attempts. If only I could manage this double dyno and catch the swing, but the foothold was set really low. That made it extra hard for me. Once I managed to stick the dyno for a split second, but there was just too much gravity. I tried a different sequence but that was also too hard. Final score: 0 tops, 0 bonuses. Never was I so close to being a boulder champion, all I had to do was sending 1 problem in 4 attempts! Congratulations to Tim Reuser and Julia Meijer, who both won their first well-deserved championship title. In the afternoon I was really happy that I made it to the finals but during and after the championship I was also feeling annoyed, angry, upset and frustrated with the given set of problems. I think more climbers would agree with me. 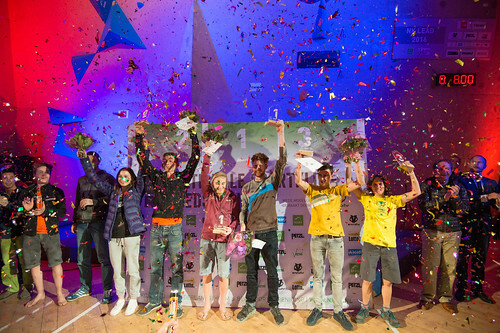 This was by far the most uninteresting final in my climbing career. I really hope we can be professional about this because I don’t want to experience this in a championship again. That is my point of view. Too bad I couldn’t show my climbing skills in the finals. I can imagine it wasn’t fun to watch for the audience and people at home who tuned in on the live stream. I know it is difficult to set boulders and make it hard and interesting enough, especially when you’re under time pressure. Nevertheless I think this time the setters should have done better. –	Don’t use new holds during a championship. It felt like sandpaper. 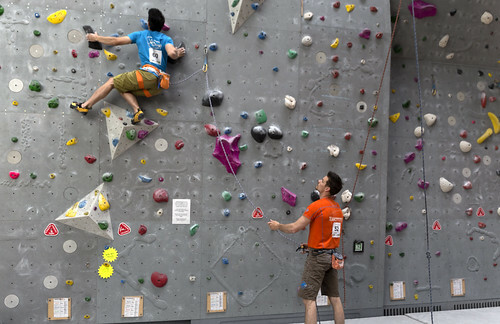 Some of the competitors had bleeding fingertips and according to the rules you are then obliged to stop climbing. I would suggest putting some chalk on the holds or use clean used holds from the gym. –	Please test all the problems properly. Well-set problems are usually tested in advance. After the finals I was told by the chief setter that the tester for the male problems was ill, meaning that these were untested. I called La Sportiva and they gave me a pair of Solutions to this problem. Find someone else who can give feedback about the problems. There are plenty of good climbers who can give feedback. Testing the problems well can be compared to studying well for an exam. If you don’t test or if you don’t study for an exam, you won’t know the outcome and you take a big risk, especially for the national championship. –	I was the shortest of all competitors. Please think of this in advance even when you don’t count me in for the finals (as admitted to me by the chief setter). A problem doesn’t always have to be reachy to make it harder! 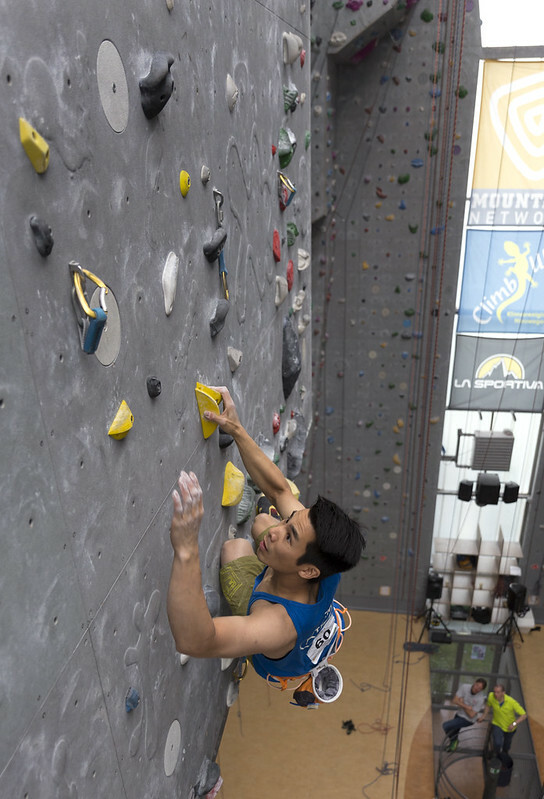 I would suggest setting the footholds higher or handholds closer and the problem would still have the same moves and would be just as hard as before. Anyway, I believe there is a lot to learn from this championship. Not only for the setters but also for the organisation. How come no one checked the problems in advance? The setters have a huge responsibility and a big impact on this day. Currently the chiefsetter is held responsible for the quality of the problems. I suggest appointing an organisation supervisor alongside a chiefsetter, who could check the boulders using a simple checklist: is it safe to climb, is it possible, did anyone test it and what was done with the feedback, is it fun to watch, are the problems diverse enough, can everyone reach the holds, did you check for lose holds, are the tapes set correctly, do you need spotters for this problem, are there special instructions needed? These are just a few questions a judge or organisation supervisor could use to make sure the problems are well set. Having much climbing experience is not even necessary for someone in this position. 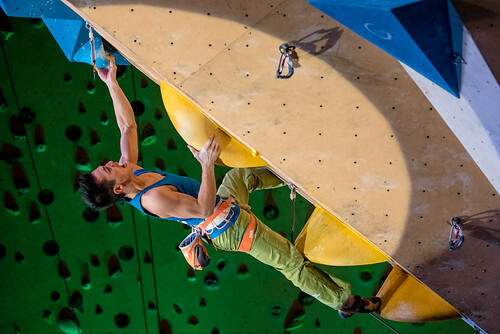 Furthermore, I understood that the walls for this competition were constructed on Tuesday and Wednesday, which means the route setters had less than 3 days to set 16 boulders. I can imagine that this caused stress to the setters. I also wonder if there was enough time to test the boulders properly and to make readjustments if necessary. Overall, I ended up in 6th place and I achieved my goal by reaching the finals. I really enjoyed the semis but not the disappointing final. Nevertheless I smiled on stage and I loved the crowd! You were all awesome. The volunteers who brushed the holds and cleaned the mats, the MCs and DJs, the judges; all of you were doing a great job! Thank you Sytse van Slooten and Zoutfotografie for the cool photos! The most important thing I want to say is that I love to climb in front of a big crowd. It gives me a lot of energy and motivation. I had a lot of fun this day and thank you all for the warm support! 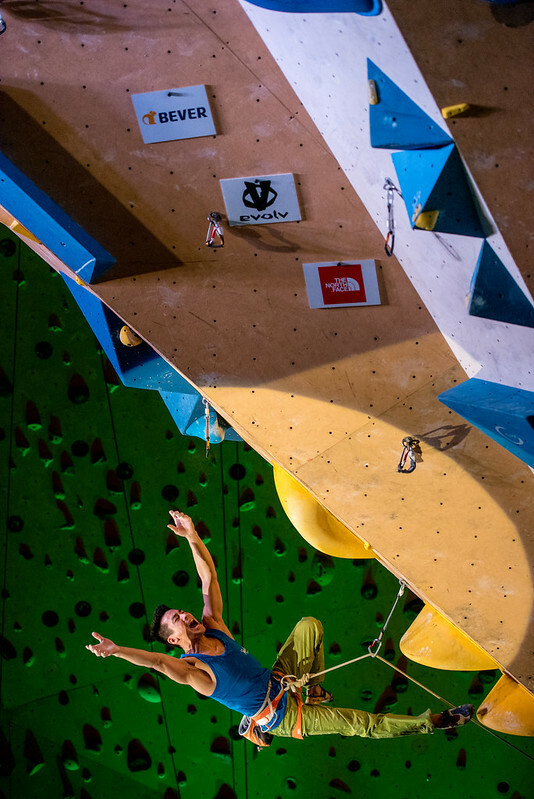 It has been 5 years since I competed in all the national boulder comps and fought for the title in the nationals. Since then I participated in just 1 or 2 national boulder qualifications each year. However, this year I wanted to take part in all the comps in order to qualify once again for the nationals. In general the boulder problems were creative, fun and sometimes more challenging than I thought. Unfortunately there were also some boulders with reachy moves, which did not suit me. Every time I could have been in the finals, but I made too many mistakes. 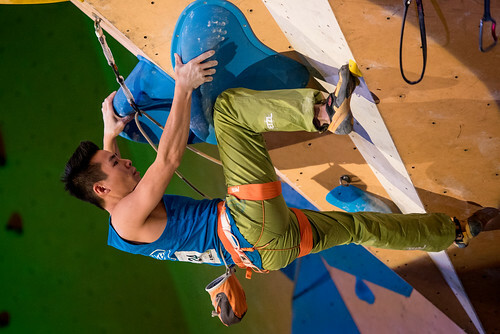 I’m glad I improved gradually and collected enough points to join the biggest competition of the year: the national championship boulder 2016! I have been counting down the days and today will be the big day to perform. Unfortunately there is no live stream for the semi finals, but at 20.30h you can tune in for the live stream of the finals! Anyway, I will enjoy my day and hope to see you in Amsterdam! !